Below are the majority of the foundation stock from which the Caspian breed originates. Imported stock and important first generation stock appear in the Archive section. Caspian names in purple are links and can be clicked to view a photo of the horse. The ICS apologises for the poor quality of some of these photographs, mostly taken from the original records of Louise Firouz and subject to copyright. STOCK BRED FROM FOUNDATION STOCK AND IMPORTED INTO THE U.K.
Hopstone Banafsheh was carried in utero from Iran via Taliyeh and is the only representative of the stallion Felfel to survive. JEHAN* was the first Caspian to be exported from Iran to the USA but had no purebred offspring. In an important development for the Caspian breed, four pre-foundation mares and one pre-foundation stallion were assessed, with their offspring, on 14th August at Knivsta, Sweden and passed as suitable phenotypic examples for registration. Breeding restrictions or recommendations were stated in some cases. The assessment of one pre-foundation mare was suspended, pending a second offspring being available. 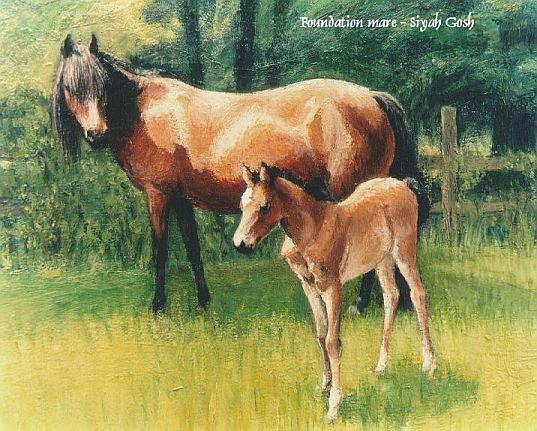 The assessment was carried out using the accepted ‘Delphi’ method and abided by the rules for acceptance of foundation stock into the pure-bred studbook as created and used by Louise Firouz herself and endorsed before her death. The assessors were chosen by the owners from a special international panel elected by ICS member societies in 2011. Atesheh Larssen-Firouz, (daughter of Louise Firouz): Atesheh grew up with Caspians, selected foundation stock with Louise and rode them for several years in Iran. She also owns Caspians in Belgium. Joan Taplin: Joan searched for foundation Caspians with Louise in the mid-1960s, imported three to Bermuda and bred the first two youngsters sold to the UK in 1971. She is currently Chairman of the ICS. Pandora Best: Pandora has bred Caspians since the late 1970s and currently keeps 25 Caspians, including several rare bloodlines. The assessments took place under the scrutiny of Mrs Liselotte Erixon, judge accredited by the Swedish Horse Board to judge Caspians. Under EC rules, the approved horses were registered with the CHS. Their passports have been amended and relevant breeding controls and recommendations stamped within them. Their registrations are being processed and their identities will be shown in the ICSB in due course. Assessments of the remaining imported pre-foundation stock are still due to take place and it is important that these assessments are not compromised before this. The assessors will again be chosen by the owner from the ICS panel. As we do not yet know when or where this will happen, no further information can be given.